Lagos has it all, from the sunshine the Algarve is known for, to some of the best beaches along this stretch of coast. An atmospheric old town with lovely churches, charming plazas, cobbled streets perfect for strolling, and pleasantly worn 16th Century walls. There are plenty of good restaurants and a lively nightlife, even the newer sections of town have charm. And, it's small enough so that you can pretty much walk anywhere. However, the downside of having everything is that a lot of people fancy visiting. So in season it can be pretty crowded and many of the best places to stay in Lagos get booked up well in advance. If you're travelling with little ones the best beach for you might be Meia Praia. This stretch of sand is a whopping 4kms long, and quite flat. When the tide goes out it leaves little pools in the sand like mini swimming pools for your toddlers. It's also a great choice for family beach games. We'd suggest you make your reservations early though as the best hotels in Lagos for families will inevitably be booked up first. The architecture of the old town is a traditional, colourful blend, and any stroll will take you to photo-worthy spots. One highlight worth seeking out is the Bone Chapel on the side of the Church of St. Sebastian, where skulls and other human bones are set into the walls and ceilings. The main church also has a bell tower, and if you can manage the four flights of stairs to the top you're rewarded with a wonderful view of lovely Lagos. You'll also want to see the marina and the Governor's Castle, as well as visiting the fish markets. Some of the Algarve's charms are most easily appreciated from the ocean, and there are plenty of companies offering day boating trips exploring the natural caves and coves around Lagos. Just around the cliff tops from town is Ponta da Piedade, a scenic spot with a pretty lighthouse, and a good place to start your boat trip. Quiet and secluded, one of Lagos's nicest beaches must be Camilo Beach. Many people are put off by the 240-odd stairs you have to climb down before you hit the sand, but it's well worth it. There are some natural caves in the cliff, so you can head off and enjoy a little adventure. If you're looking for a beach to sup by, Praia do Porto is worth a look. There are a number of restaurants and bars right up against the long stretch of sand. If you need some time away from the beach you can spend the day at the zoo, whilst there are also horse riding day trips, a golf course and a little museum. Head along to Ponta da Piedade and enjoy the wonderful ocean views from the clifftops. Whilst there's no beach per se, you can always head off exploring the area as there are indeed a number of small beaches dotted around. A lovely spot from which to observe the sunset. Spend your evening at the Centro Cultural de Lagos, bang smack in the heart of town. Enjoy an evening meal or tipple from the bustling restaurants and bars whilst you watch the numerous street performers including Flamenco dancers, acrobats and musicians. Plus, from time to time there are theatre performances, though these are usually in Portuguese. Spend a few hours at the Parque Zoologico de Lagos. You can go swimming with the penguins, chill out with the lemurs inside their enclosure or play with the friendly monkeys. A friendly spot with well looked-after animals, a great option for families. Wander around the peaceful Church of St Anthony (Igreja de Santo Antonio) and take in the beautifully ornate interiors, complete with gold-leaf. There's also a museum that's well worth checking out, housing a variety of artefacts spanning from the Bronze Age to more recent eras. Whether you're here for lazing on the beach or doing something more active, our pick of the best places to stay in Lagos will hit the spot. Quinta Bonita is one of the best places to stay in Lagos if you're looking for a romantic spot. Just out of town, this hotel has a rural quiet, and panoramic views which make it easy to imagine you're the only ones on this stretch of coast. Each of the eight suites has an old fashioned glamour, some have four poster beds. 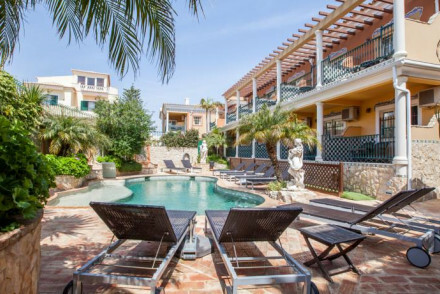 If you want to be right on the beach, one of the best places to stay in Lagos is Vivenda Miranda. Stroll through the sub tropical gardens and you'll find yourself on Porto de Mos beach. Built in the 17th Century, this villa has had a characterful conversion, and the rooms are colourful and unpretentious. 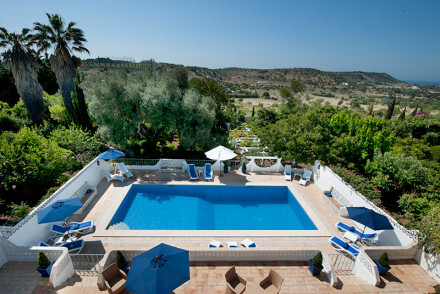 For serious luxury on the outskirts of town, book Vila Valverde. This stunning property offers contemporary interiors, beautiful grounds, stunning views and fabulous food... what more do you need? If you're going to Lagos on a romantic getaway then Dom Manuel I Charming Residence is the place for you! 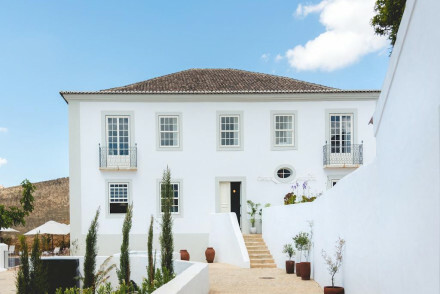 This adult-only spot boasts cosy accommodation decorated in a classically Portuguese style, whilst it's also only 500 metres from one of the best beaches around. Or, you could simply relax by their pool and enjoy a cocktail. Sometimes, you decide you need your own space... so how about a holiday villa or apartment? We recommend the wide range available with our online partner, Booking.com. Weather-wise, Lagos is obviously nicest in the summer months, with July and August experiencing an average temperature of 24°C. That said, this is peak tourist season (from 21st June-21st September) so expect there to be a fair number of tourists and accommodation to be on the pricier side of things. If you don't fancy the crowds then visiting in spring or autumn's a good bet - when the weather's still perfectly pleasant but there's less hustle and bustle. If you're flying from abroad then the nearest option is Faro Airport, located about 90 km east of Lagos. Ryanair offer direct flights from Stansted, Bristol, Dublin and Bournemouth. Easyjet goes from Gatwick, Newcastle, Southend, Belfast and Luton, whilst British Airways goes from Gatwick. So there are plenty of options to choose from! From Faro Airport, hop on the number 14 or 16 bus towards the city centre which costs €2.25. Once here, you can either take the bus or train to Lagos (taking around two hours), though be warned that the last train departs at 8:20pm. This should cost you €7.30. Still not sure which is the best place to stay in Lagos for you? Browse through our list of all the best places to stay in Lagos. Alternatively, call or email one of our friendly gurus for advice. A charming adult-only hotel with outdoor pool in a tropical palm covered garden. Traditional Portuguese tiles adorn cosy bedrooms and colourful communal areas. Enjoy drinks and bar snacks by the pool or explore the many bars and restaurants nearby. Just 500m from one of Lagos' best beaches. A rural romantic hotel with beautiful gardens and a lovely pool. Suites are glamorous in an old world sort of way - elegant four poster beds, pale mother of pearl coloured throws, and stone floors, all with private balconies. Very picturesque, and grown up. Romantic Break - A wonderfully private and secluded spot, beautiful gardens and fabulous beaches, romantic walks or simply poolside heaven. Lavish accommodation surrounded by orange groves and olive trees. Contemporary white building with lots of natural light, huge terraces, and beautiful views over the grounds. Portugese specialities in the restaurant and lovely swimming pool. A real hideout in supreme comfort. Total relaxation - Crafted for relaxtion, with comfortable suites, massage treatments, sauna and laid back atmosphere. 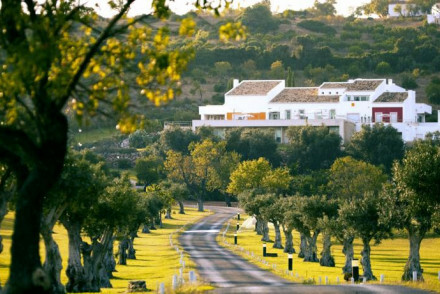 Great walks - Explore the Monchique hills on foot, the hotel will provide a light packed lunch. Fishing - The hotel will organise big game fishing trips on request. Intimate 17th Century villa resting in luscious tropical gardens, overlooking the Atlantic Ocean. Organic Mediterranean food, made with fresh local produce. Comfortable rooms surround the pool and bask in the undisturbed ocean view. A charming resort with Provencal style rooms. Spa breaks - Pampering spa with extensive choice of organic, ethical and sustainable treatments, sauna, steam room, foot spa and jacuzzi. Romantic Break - A secluded paradise on the Atlantic- plenty of opportunities for romance with sunset walks and candlelight dinners for two. Local markets - The summer months see the streets filled with trinkets, however the Fish Market in the early morning is worth a visit. Sights nearby - Lagos town is a beautiful example of an old Portuguese fishing town, fort and all. A striking white property standing tall in the historic streets of Lagos. Find a perfect mix of traditional and contemporary design throughout with white on white hues, wooden floors and plenty of glass. An excellent restaurant serves up traditional healthy fare and a choice selection of wines. Local exploring - Well located to explore the historic city and access the beautiful beaches. Kayaking - Kayak along the coast to marvel at the natural arches and explore the caves. Sights nearby - Admire the stunning frescoes in the Igreja de Santo António. Great walks - Wander through the historic streets of Lagos.